Preparations for the remodeling of the lower level of the Holmes Student Center are moving into high gear. All dining options on the lower level will officially be closed as of Friday, May 11, when the Blackhawk serves its last lunch. The Subway served its last sandwich on Tuesday, May 8, and the Coffee Corner was closed in April. Those eateries will be replaced by three new restaurants and a convenience store that will not only be available to faculty, staff and visitors but also will be tied to student meal cards. Those will include national chains operated by the university under franchise agreements. Until those venues open in the fall of 2019, Coffee and Bagels, on the lower level of the Founder’s library is offering coffee drinks by Caribou and food by Einstein’s Bagels. The Huskie Books and Gear Bookstore will close its doors, Monday, May 14. Until then, the store is offering clothing, giftware, art, school and office supplies (for individuals and departments) at 75 percent off. A temporary spirit wear store will open in the Gallery Lounge on the main floor of the building on Monday, June 4, and all book purchases can be conducted online. Students can have books delivered to their homes or can arrange to pick them up in Room 141 of the Holmes Student Center. Around that same time, the School of Theater and Dance will move out of its temporary space in the Diversions Lounge, and into its new state-of-the-art facilities in the Stevens Building. Also leaving will be the One Card Office, which will move to new quarters in the Founder’s Memorial Library. A temporary wall will be put in place Monday, May 14, blocking access to the building’s lower level. Prepatory work will begin almost immediately, with construction slated to begin in early July. The $20 million overhaul of the space will amplify the building’s role as an important hub of student life on campus. 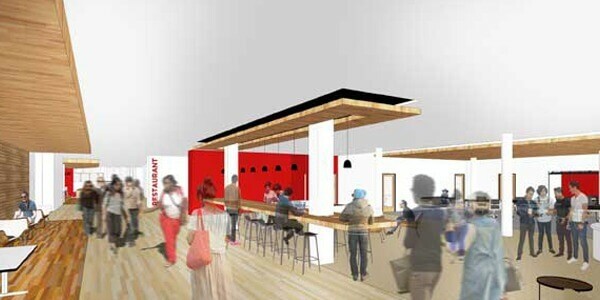 In addition to the four new dining options, the remodeled space will become the home the Office of Student Involvement and Leadership Development and key student organizations, including the Campus Activities Board and the Student Association, creating a central nexus where student leaders can collaborate and share ideas. Plans include large, bright, comfortable lounges throughout, featuring spaces where students can study, meet or just relax. A revitalized Huskies Den and other spaces built into the facility will create new opportunities for recreation, entertainment and student performances. The plans also include a new transit lounge, specifically designed to better accommodate the building’s function as a transportation hub on campus. All of these new spaces will be distinctively branded with Huskie colors and themes to help stimulate a sense of belonging and community designed to bring student life back to the student center.